This is a tale of a multi-use forest. 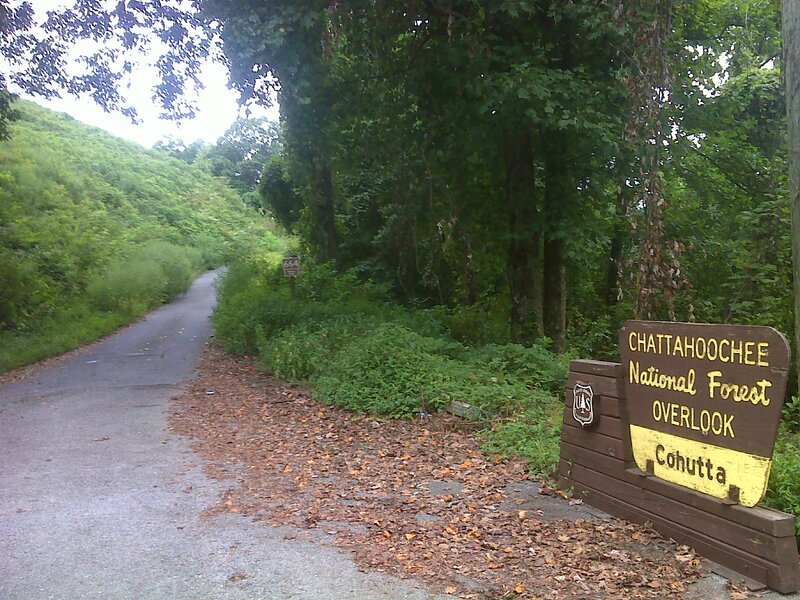 Chattahoochee National Forest has established trail networks for many purposes, and the Pinhoti Trail traverses several of them. 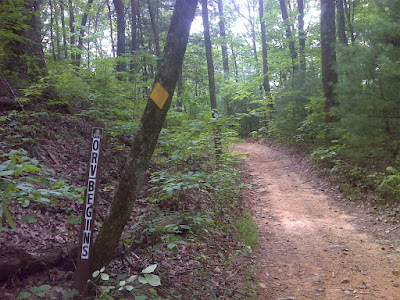 When the westbound Pinhoti Trail leaves the Mountain Biker trail network at Bear Creek, it begins heading toward Rock Creek, which has an ORV (Off Road Vehicle) trail network. ATV's are ORV's. Dune Buggies are ORV's. Motorcycles are ORV's. And to get technical, so are military tanks, farm tractors, forklifts, cranes, backhoes, bulldozers and golf carts. The one thing ORV's have in common is that they are motorized. 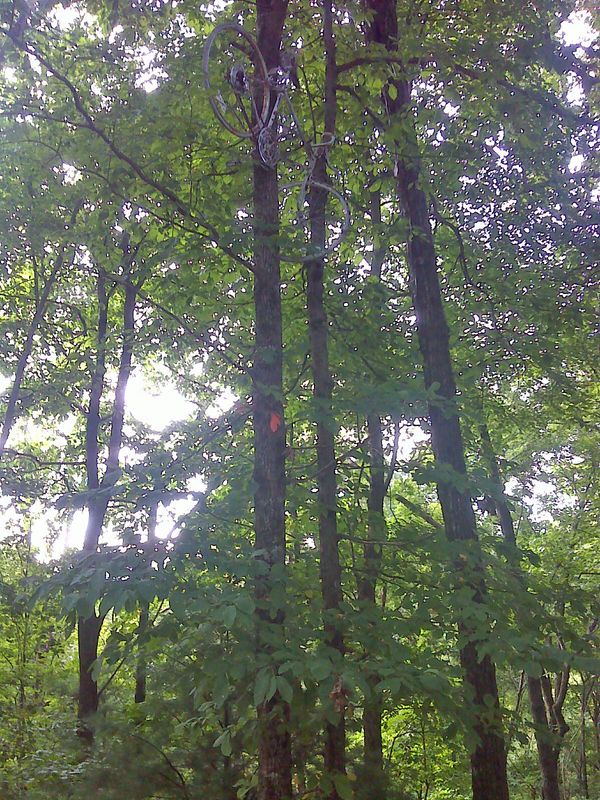 And the one thing about motorized vehicles in the woods (with the blessed exception of golf carts) is that you can hear them from miles away. Inseparable from the fun of wheeling around in the woods on an ATV seems to be making loud noise. And seemingly inseparable from the psyche of the ATV rider, is the challenge that the vehicle's name (ALL-terrain vehicle) implies. Wherever there's a sign that says ATV's are prohibited, somebody on an ATV is bound to tear it down and roar on through. Wherever property owners put up physical barriers to prevent ATV's from entering, somebody on an ATV is bound to consider it a personal challenge and find a way over, under, around, or through the barrier, no matter how elaborate. So this report is about a part of the Pinhoti Trail that seems incurably infested with motorized vehicles. After a half-mile road walk along Highway 2/52, the trail makes a short jog through the woods on foot/mountain-bike trail, then joins Tatum Lead Road - a public gravel road that climbs up over the section's high point (Tater Top ... uh ... Tatum Mountain) and follows the 'lead' - a long continuous ridge that extends for many miles along the Murray-Gilmer County Line. 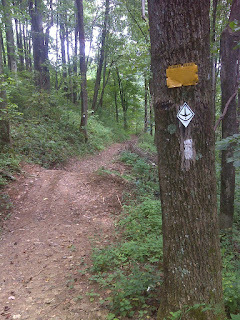 Much of this ridge is private land, but eventually the road enters national forest property at the point shown in the photo up top. After another mile the Pinhoti Trail turns off Tatum Lead Road and drops down to Rock Creek on a section that is nominally closed to motorized vehicles. The yellow sign says 'Closed to Vehicles'. Steep mounds and vertical-sided trenches and two sets of deeply embedded concrete posts were in place. None of them worked. But there were fresh motorcycle tracks when I passed through, and plenty of evidence that ATV's had transgressed. And the sound of distant ATV's echoing through the woods was a constant part of my audio experience. It seemed inevitable, because on the other end of this 'closed-to-vehicles' section, the trail comes out on open public road again, and that road leads directly to the main Rock Creek ORV parking/staging area (what we'd call a trailhead). Rock Creek itself is one of those beautiful, rhododendron-lined, tumbling mountain streams in a deep, cool ravine. 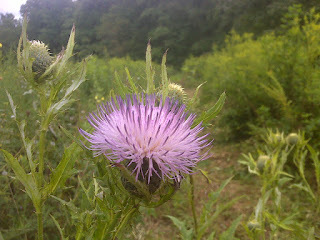 It was a wonderful natural place to hike beside. I can see why those who go into the woods, via whatever mode of transport, would want to come here. 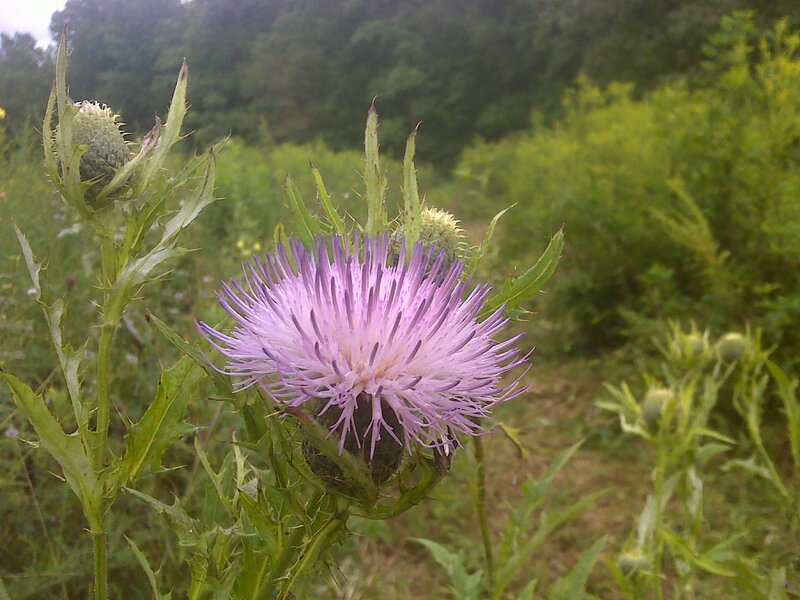 But for reasons perhaps subliminal, the only photo I took through the Rock Creek ravine was that of a plant so thorny that some people consider it the ultimate in unwanted species - that noxious weed, the common thistle - in a wildlife clearing. What else caught my attention today? 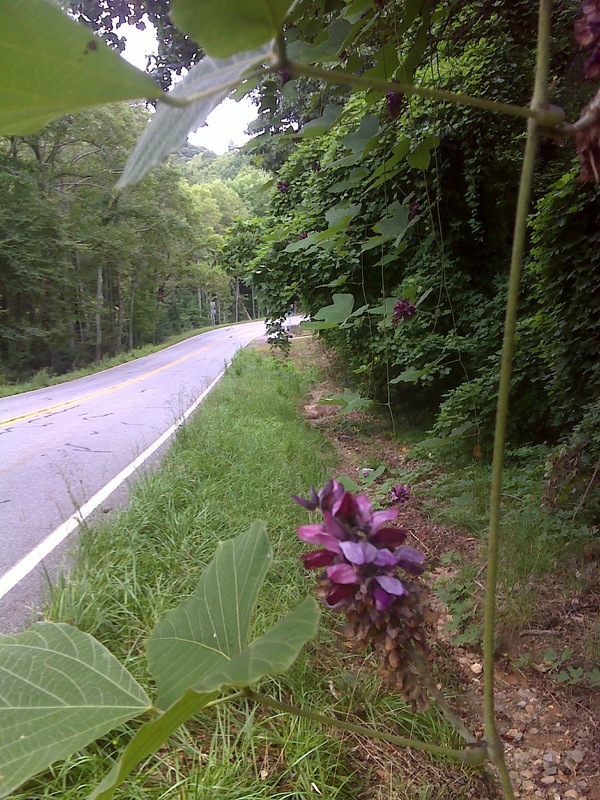 The Kudzu was in bloom along the half-mile road walk on GA 2/52. It was interesting to me that, although Kudzu is a dangling, twining vine, its flower clusters grow upright on their stalks. 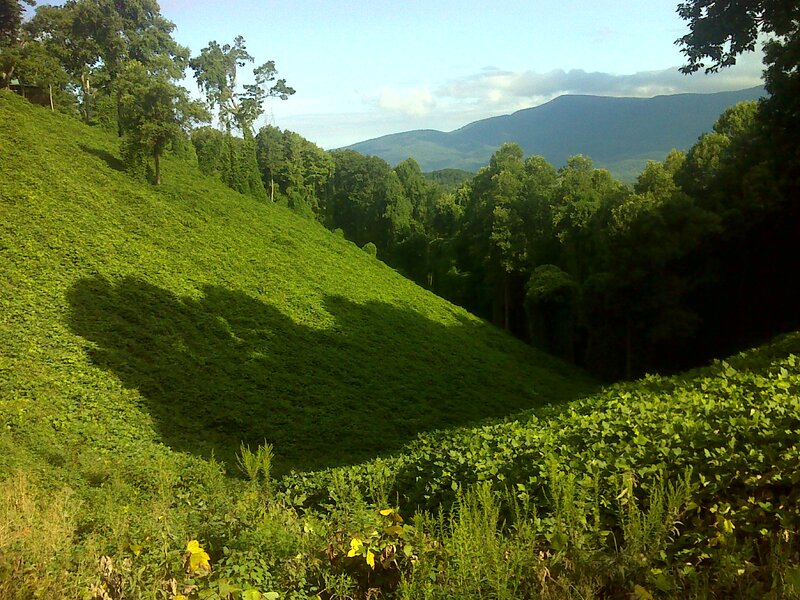 There is probably no more pernicious invasive in the Southeast US than Kudzu. 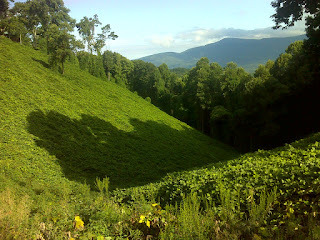 Here is what Kudzu does to the forest - this scene was also right along the Pinhoti road-walk. It smothers every tree and shrub to death, leaving a mono-culture ground cover where nothing else can grow. Nice view, huh? Elsewhere along the same road-walk there was an unwanted bicycle. Can you spot it? They say it's been there for years. And where the Pinhoti left the pavement and entered the woods there was another reminder of things unwanted. 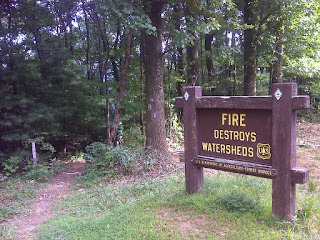 It had been wet lately here in North Georgia, thankfully, but I just left NC's Mountain's-to-Sea Trail because a section of it had been closed by fire (see that report here). I promise - my next report, covering the next section of the Pinhoti as I work my way west toward Alabama, tells a much more uplifting story. 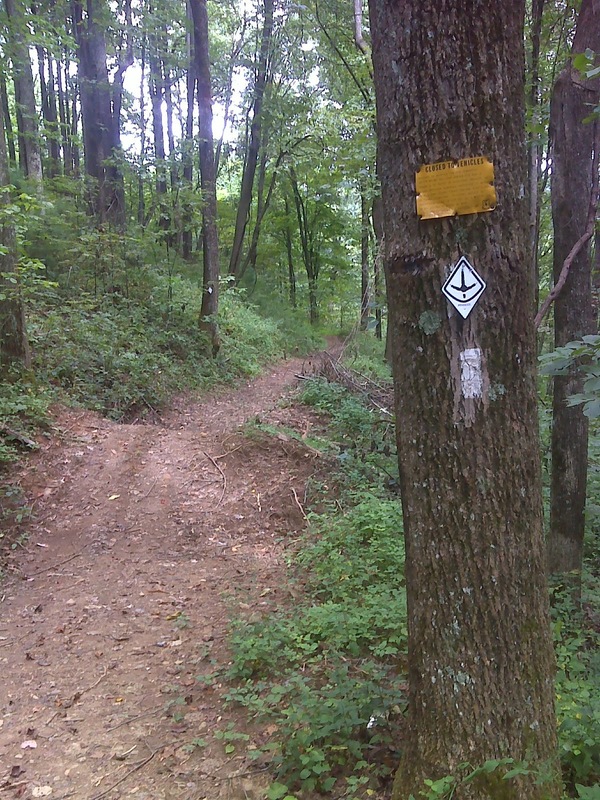 New trail has been built and opened within the past couple years. It was butterfly country, and it's all for us non-motorized travelers. Stay tuned.